What's a Buff? It's a multifunctional tubular accessory for your head that's ideal across a wide range of activities and conditions. Buffs keep you warm in the cold and cool when its hot. Moisture wicking, lightweight and breathable the Buff is the height of comfort! What&apos;s a Buff? It&apos;s a multifunctional tubular accessory for your head that&apos;s ideal across a wide range of activities and conditions. Buffs keep you warm in the cold and cool when its hot. Moisture wicking, lightweight and breathable the Buff is the height of comfort! Buffs can be worn as a neckerchief, headband, wristband, mask, hairband, balaclava, scarf, scrunchie, saharaine, piratecap, beanie, bandana, and well...you get the idea. The Insect Shield UV Buff has built-in insect protection using repellent technology from Insect Shield. Insect Shield UV Buff is infused with an ordorless insect repellent that&apos;s effective against most biting insects and will last through 70 washings. 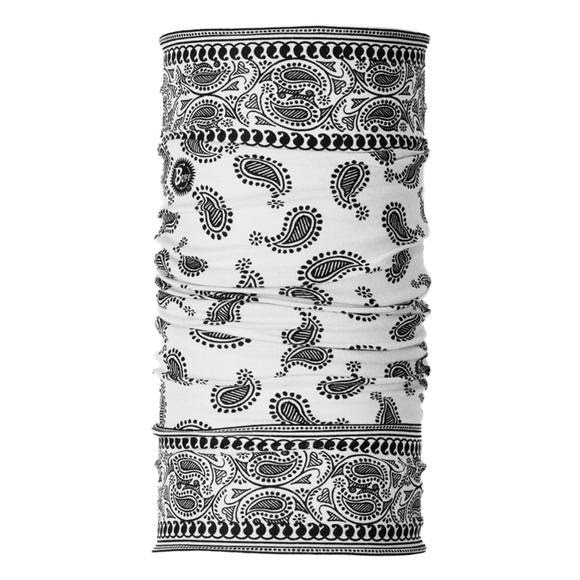 Top that with 95% UV blockage and Polygiene odor control so you stay fresh longer and you&apos;ve got one effective Buff! Polygiene is a breakthrough, patented antimicrobial technology that employs ionic silver to inhibit the growth of microorganisms. Independent tests have shown the technology to have high efficacy against harmful bacteria andï¿½fungi. The Insect Shield UV BUFF is infused withan odorless insect repellent that is effective against mostbiting insects such as mosquitos, ticks, ants, flies, chiggers and midges. The EPA requires extensive effectiveness data to prove a product&apos;s ability to repel insects, and InsectShield has passed all EPA testing levels. This technology will last through 70 washings, and is EPA registered to perform to that level. When total focus on your performance is key, COOLMAX Extreme Performance fabric is what you want: a no-nonsense fabric that meets your most demanding standards. Engineered and designed for the serious sports participant, COOLMAX Extreme Performance fabric delivers the very best. Count on COOLMAX Extreme Performance fabric, with its state-of-the-art moisture management properties and physiological benefits of keeping lower skin temperature, greater hydration and reduced perceived physical exertion during exercise, to deliver you the power of unwavering performance.